We at Geeky Hobbies would like to thank Plethora-Project LLC and Devolver Digital for the preview copy of Block’hood used for this preview. Other than receiving a free copy of the game to preview, we at Geeky Hobbies received no other compensation for this preview. Receiving the preview copy for free had no impact on the content of this preview. In Block’hood you take on the role of a city planner. Players use over 90 different blocks to build the city of their dreams. Every block added to the city requires different inputs to function properly and produces outputs that are used for the betterment of the city. The idea is to use the outputs of certain blocks to provide the inputs for other blocks which will create a self sufficient city. Block’hood plays like other city builders where you build houses, businesses, and factories as you try to expand your city. The main difference is that Block’hood plays more like a puzzle game than most city builder games. Where in most city builders you are mostly in charge of population, pollution, money, water and a couple other resources; in Block’hood you have to manage a bunch of different resources at the same time preventing any of them from becoming too low. The other area where Block’hood differs from traditional city builders is the block nature of the game. Each block is a different building/object and you mix and match them together to make your city. While most city builders have you build horizontally along the ground, Block’hood focuses on building upwards as you create your own tower. Being in early access, Block’hood is still a work in progress. At the time of this preview the game has two main modes. There is a tutorial mode and a challenge mode that basically teach you how to play the game by giving you various scenarios to complete. Currently there are twelve challenges that range from beginner to advanced. In addition there is a sandbox mode where you can build the city of your dreams with no designated goal. The biggest concern with most Early Access games is you don’t know what you are going to get out of the final game. Most games are only in a semi-complete state when they are first added to Early Access. These games usually have some of the features in place but things are still missing and the game plays more like a demo/demonstration of what the game could become once it leaves Early Access. This is not the case for Block’hood. Block’hood is probably one of the most polished games I have seen on Early Access during its’ initial launch. The game is perfectly playable at this time and it doesn’t feel like a scaled back experience where you feel like you are waiting for the full game to come out. You can fully enjoy the game in its’ current state and if nothing else were added to the game you could be satisfied with the experience. The developers are adding more to the game though which means that the game should only get better. While Block’hood is not going to be for everyone, I think it is an interesting look at the city builder genre of games. While you can make a beautiful city (just look at some of the cities built on the Steam page), I approached the game more as a puzzle game. That probably had something to do with the fact that I am not much of a designer. One look at one of my cities and that would become quite obvious. While players with more design skills might have more fun with the game, players that want to look at the game more analytically can still have fun with the game. I saw Block’hood as a puzzle game since your city is basically a large puzzle as you try to balance all of your resources. You need to make sure you have enough of all of the necessary resources or you risk having your city fall into disrepair. The game is a balancing act of all of the different resources which forces you to build your city slowly/patiently. Rush too quickly and everything will fall apart quickly. Block’hood is a unique experience unlike any other city builder that I have ever played. While it takes a while to adjust to, the controls/mechanics in Block’hood are really well designed. For the most part you just select your desired block from a set of menus and then pick where you want to place it. You also have menus that let you see your resources as well as which blocks are in danger of decay. The camera controls are simple and work well for the most part. If you make a mistake you can easily remove a block with no punishment other than losing the resources that the block would have generated if it was still there. Difficulty wise I would say that the game is about right. The easy and medium difficulty challenges are a little on the easy side but the advanced challenges are quite difficult. While playing the easy and medium levels you might think that it is impossible to lose a challenge since you can just rebuild your city if you make a mistake. Things can go wrong quickly if you don’t plan things out though. Ignore one key resource and you could lose most of your city if you don’t fix it quickly. It is key to create a good foundation for your city and then slowly build upon it. Once you get a steady stream of resources you can start building up your cities at a much quicker pace. Finally the graphic style in Block’hood is great. While all of the blocks in the game utilize a blocky style, there is no denying that the artwork in the game is fantastic. Creative players will be able to combine the different blocks together to create amazing looking cities. While the game does a great job with the tutorial, Block’hood is not the type of game that you are going to be able to immediately pick up and play well right away. Block’hood has a learning curve that takes some time and you don’t want to skip the tutorial. This isn’t saying that the game is overly complicated since I think the game does a good job making the game accessible. With this type of game it just takes some time commitment to fully understand how to best play the game. When you first start playing the game you will make mistakes that you will learn from for your next city. Being an Early Access game there are a couple tweaks that could be made to improve the game. Most of these are quite minor. The one thing that I would like to see though would be for it to be a little easier to put blocks in the spot you want. Usually it is easy to place blocks in the area you want but sometimes the game thinks you want to put it onto a neighboring block. This means that you will have to move your mouse around to find the exact spot needed to put the block in the correct spot or rotate the camera in order to get game to realize where you want to place the block. This isn’t a huge problem though since it is usually fixed by rotating the camera and isn’t that prevalent in the first place. If you aren’t big into sandbox mode there also isn’t a lot of content right now. There is currently only twelve challenges in the game. This is one of the areas where additional content is planned to be added though so I am guessing this isn’t going to be a con for long. With a game like Block’hood it is kind of hard to judge how much playtime you can get out of the game. If you just play the challenges and then quit playing the game I would guess that you would get around 5-7 hours out of the game. Being a creative city builder though I could see players that love these type of games getting a ton of playtime out of the game. I could see players getting 100+ hours out of the game if they really like creating things. At this point in Early Access the game retails for $9.99. The game is expected to rise in price by 20% when it exits Early Access. As I have already mentioned, despite being in Early Access, Block’hood already feels like a full featured game. If you like these type of creative games and could see yourself spending time in the sandbox mode, I think you will easily get your money’s worth out of the game. For an Early Access game just released, there isn’t much more you can ask for from Block’hood. The game already shows loads of polish and if nothing else was added to the game it would still feel like a full experience. 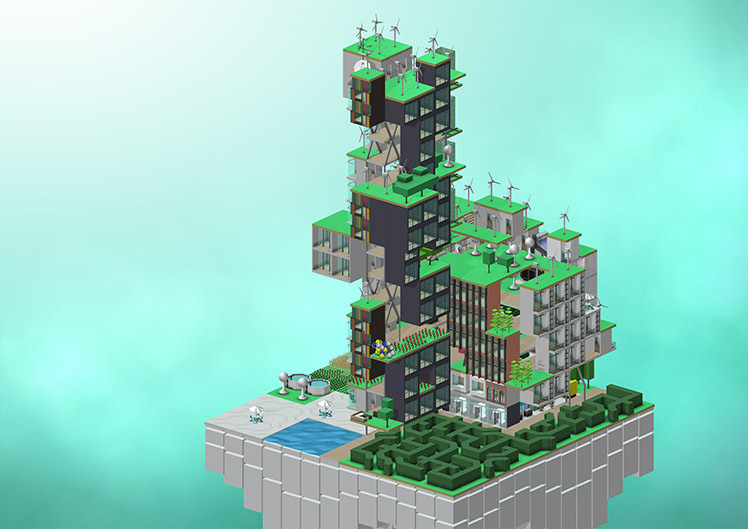 Block’hood is a fun and interesting take on the city building genre. Players who are fans of creative building games, should love the game. Even if you aren’t creative or a good designer you can still have fun with the game since it is an interesting puzzle game as you try to balance all of your resources to create a thriving city. If the concept doesn’t really appeal to you, Block’hood probably isn’t going to be for you. If you like city building games and/or Block’hood looks interesting to you though, I think you should really look into picking up the game. A really interesting puzzle/city building game. Very polished for an early access game. Takes a while to learn how to play. Sometimes it is hard to place blocks in your desired location.